Sony’s new 31-inch Grade 1 reference monitor, the BVM-HX310, offers accurate color reproduction and high-contrast performance to provide professional content creators enhanced flexibility and precision for critical picture grading decisions. The launch of the new reference monitor also marks the introduction of Sony’s new technology brand TRIMASTER HX. The BVM-HX310 was developed in response to the industry’s desire for accurate picture evaluation, especially in the reproduction of high contrast images. It is able to correctly reproduce images down to individual pixels due to a combination of the Sony specified and dedicated panel and its newly developed display processing technology. It is also fully capable of reproducing 4K and High Dynamic Range (HDR) content, supports industry standard brightness of up to 1,000 nits in full-screen and a 1,000,000:1 contrast ratio for HDR productions. “Drawing on decades of post-production and live production expertise, as well as direct work with the industry, the BVM-HX310 has been designed to provide professionals with images they can trust, helping them to work more efficiently and achieve better creative focus, whether on location or in a studio,” explained Rose Jersey, Product Marketing, Sony Electronics Professional Solutions Americas. Sony also introduced its new technology brand, TRIMASTER HX. HX represents the combination of both HDR (‘H’) and Liquid Crystal (Xtal) Display (‘X’) technologies. Sony monitors of this range offer accuracy, consistency and quality color reproduction. 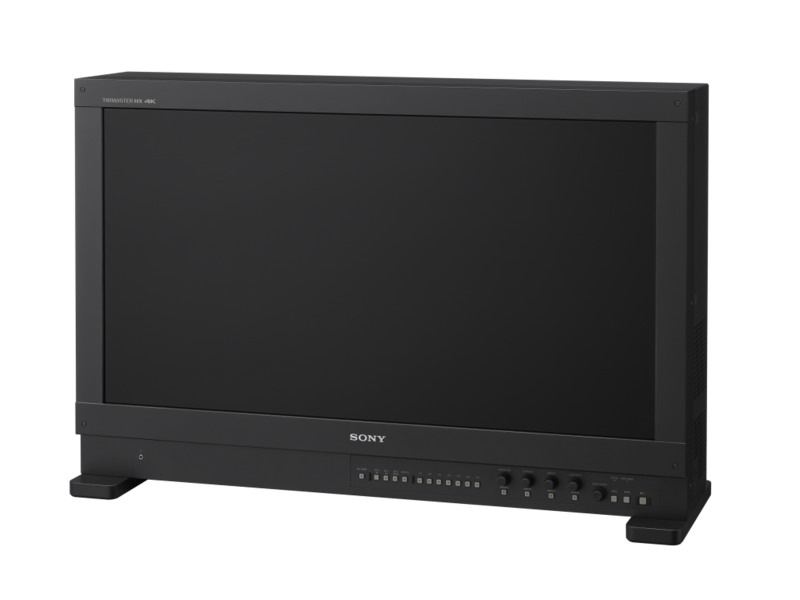 The BVM-HX310 supports all industry standards and hosts all major HDR EOTF and, for the first time in Sony professional monitors, 12G-SDI is supported, enabling simple 4K transmission with a single SDI cable. It handles ITU-R BT.2020 color space and HDR images with Hybrid Log Gamma, SMPTE ST2084 and 2.4 (HDR) gamma alongside S-Log2, S-Log3 and S-Log3 Live HDR for SR Live Workflow. Additionally, the BVM-HX310’s User LUT function will allow operators to load pre-defined Look Up Tables based on their viewing requirements; Onset or in Post Production. The existence of multiple EOTF in 4K/UHD, in addition to multiple color spaces and RGB ranges, gives rise to potential complexities in source identification. To address this, the BVM-HX310 incorporates Video Payload ID (VPID) which identifies signal information embedded in the SDI interface to help switch to appropriate display settings automatically – minimizing the potential for a human error. It also offers a Quad View mode, allowing professionals to view up to four customized individual display settings across the monitor in HD (including EOTF, color space, transfer matrix and color temperature), previously introduced on the PVM-X550. This quad view mode newly supports User LUTs from the BVM-HX310. Sony will be exhibiting this technology at IBC 2018 on stand 13.A10 in the Elicium Hall, RAI Amsterdam.